Hats Off To Benchley Bros! 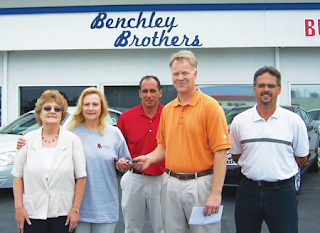 Benchley Brothers GMC dealership in Clare has been a significant part of this community since 1972. They have supported many fundraisers and community activities in the area simply because of their compassion for others and a desire to make a difference. On Thursday, July 22nd once again, Jim Benchley came to the aid of a local organization. Arming himself with a huge smile and a shiny set of vehicle keys, Jim made a donation to Joshua’s House Maternity Home. 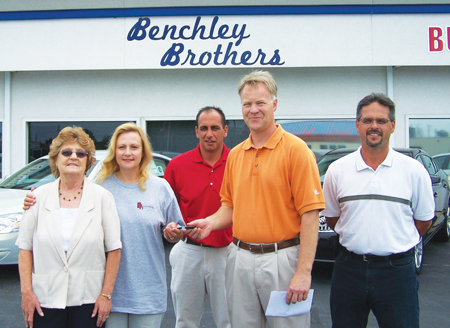 “What a blessing it was to receive a phone call from a long time customer of the Benchley’s notifying us that the dealership was donating a vehicle to our organization. This donation will assist us in transporting our expectant mothers to and from their doctors visits and required destinations in order to care for their health and the health of their unborn babies,” Said Executive Director Rene’e Jeffords. “We couldn’t be happier with their generosity, and it couldn’t have come at a better time.” Joshua’s House had been utilizing vehicles that were privately owned by volunteers working for Joshua’s House. Some of the vehicles are very old and on their “last leg” and soon would be quite costly to repair. “Safety is always first with us and now this is just one less concern that we have to keep an eye on” said Jeffords. “How wonderful it is to have a group of people like the Benchley family of employees to want to help as you care for those in our community that are in need.” The staff and residents of Joshua’s House are extremely thankful for this generous effort of support.